Looking to get into that holiday spirit, but don’t have the DVDs to marathon over break? Come in to the Regina Library and check out till your heart’s content! From How the Grinch Stole Christmas to Last Holiday, we have something for everyone’s holiday taste. Come sing along with Bing Crosby in White Christmas or cringe as the Griswolds survive the holiday season in Christmas Vacation…the sky’s the limit! 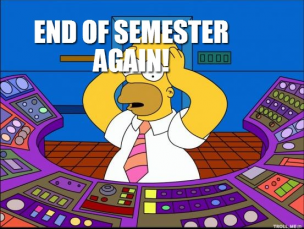 Oh and also….Congratulations on making it to the end of the semester!!! We’ve had a wonderful time helping you in all your research and formatting needs, and look forward to seeing you again in the New Year!! Everyone stay safe, warm, and jolly! Have you heard? The library is playing host to several therapy dogs during finals to help ease your stress! Check out your favorites and come in for a pet!